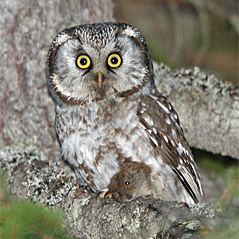 Based in Oulu for three nights, we search for Eurasian Pygmy-owl, Ural, Great Grey and Boreal Owls and the less-predictable Northern Hawk Owl whose numbers fluctuate with rodent populations. Other targets include Hazel Grouse, Terek Sandpiper and Black and Eurasian Three-toed Woodpeckers whilst Siberian Jay and Parrot Crossbill are also possible. Day 1 Scheduled flights from London to Helsinki and then on to Oulu arriving mid-afternoon, when we will transfer to our local hotel for the next three nights. The search for owls will start this afternoon/evening and, hopefully, before retiring for the night, we will have at least one species 'in the bag'. Days 2–3 Both day after breakfast the search for owls will continue: Great Grey, Short-eared, Boreal and Ural Owls and Eurasian Pygmy-owl all breed close to Oulu in good years and are normally relatively easy to locate with expert assistance, but Northern Hawk Owl takes a lot more hard work! During the course of the days we may also see Whooper Swan, Common Crane, Hen Harrier, Western Marsh-harrier, Eurasian Woodcock, Terek Sandpiper, Temminck's Stint, Ruff, Eurasian Woodcock, Black and Eurasian Three-toed Woodpeckers and Common Redpoll. Also possible are Black and Hazel Grouse, Pallid Harrier and Red and Parrot Crossbills and in some years Eurasian Capercaillie and even Siberian Jay. Day 4 After a good morning's birding and lunch we will return to the airport for our flight to London via Helsinki. General Information The pace of the tour is mainly moderate but long hours will be spent in the field, with some early mornings and late evenings. Clothing and footwear suitable for walking and adverse weather should be brought. Finland has a high cost of living and everything is expensive compared with the UK, especially alcohol. Group Size Minimum number for tour to go ahead: 7; maximum group size: 14 with two leaders. Price includes scheduled economy flights between London and Helsinki and Helsinki and Oulu, all transport in Finland, all accommodation in medium-standard, twin-bedded, en-suite rooms, all meals and services of the leader throughout. Excluded are insurance, drinks, gratuities and items of a purely personal nature.